Another year, another set of resolutions. This year I made very few as I was keen to follow them all year round and thought having only a few easy ones would be the key to my new year resolution success. Sadly, it is not even the end of January and almost all of them have been broken. I sincerely thought this was my year to achieve them, but it is my birthday this week and since I intend to celebrate it wholeheartedly (gluttonously and tipsy) these 3 will be out the window by the weekend. But there is some hope. I do have a few resolutions left and definitely one that I intend to keep: Blog more. So here we go with my first post of the year, with hopefully many more to come. NOTE: It is important you get the small short tender okra, not the long hard one. The hard one never tastes as good. I usually find good okra in the organic markets or organic section of the grocery store. If you cannot find it, perhaps try the Indian grocers. 1. Saute onion in oil until soft and translucent on medium high heat(do not brown). 2. Add turmeric, chili and salt. 4. Add chopped bhindi and cook uncovered until soft. My hubby prefers it quite soft so cook at least 10-15 minutes stirring every couple minutes. Serve with any Indian bread such as tandoori roti or paratha. Serves 2. 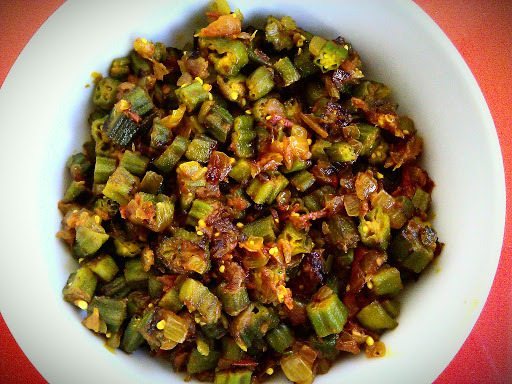 This entry was posted in Indian/Pakistani Recipes, Main Course and tagged Bhindi Bhaji, Indian, Indian Spiced Okra, Vegetarian by thepantrydiva. Bookmark the permalink.